Washington Gov. Jay Inslee is trying to avoid swallowing a "poison pill" in the battle against climate change. After their record-long, triple-overtime legislative session, Washington State Gov. Jay Inslee managed to unite Republicans and Democrats once again last week — over their opposition to an idea floated from Inslee himself. During the legislative session, as Republicans and Democrats were in negotiations over gas prices and transportation funding, discussions were complicated by the idea that Inslee, by executive action, might implement low-carbon fuel standards. Republicans were opposed to such standards, warning they could send gas prices in Washington skyrocketing. So Senate Republicans put a "POISON PILL" — Sen. Michael Baumgartner prefers the phrase "sensible handcuffs" — in the transportation package: If the governor unilaterally implements a tougher carbon fuel standard, $2 billion in funding for bike, transit and pedestrian projects in the transportation package would revert to funding for roads. Spokane, for example, would still get its freeway funding, but would lose its state funding for the Central City Line and the U District pedestrian bridge. The Republican maneuvering was seen as a defeat for Inslee's environmental agenda. 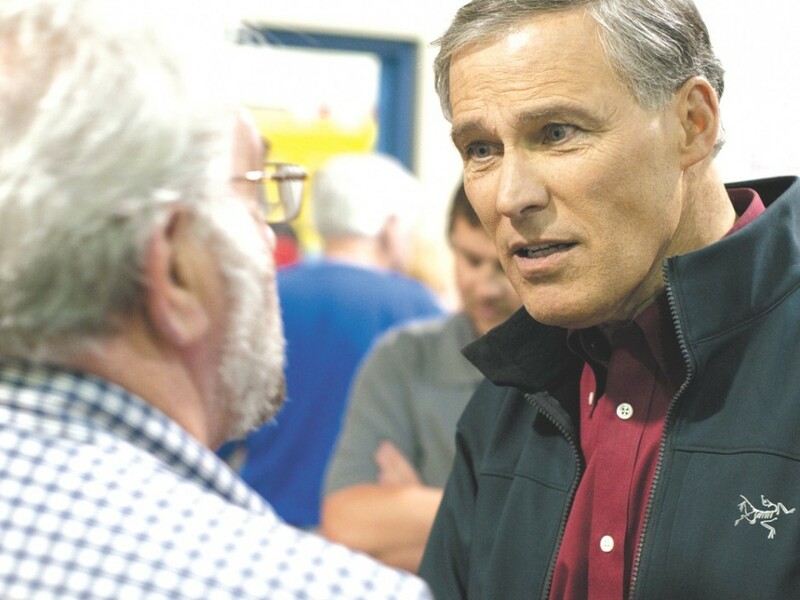 "Inslee the 'greenest' governor? Not so much," read a recent Seattle Times headline. But last week, Inslee was weighing swallowing the poison pill anyway. Objections came from Republicans like Baumgartner, and from Democrats like Andy Billig and organizations like Washington Bikes. "No one supports it," Baumgartner says. "It would be idiotic for him to do it politically." On Tuesday, however, Inslee announced he'd found a third way: Over the course of a year, develop a regulatory cap on carbon emissions. Since it isn't a low-carbon fuel standard, the poison pill wouldn't apply, Inslee said. Democrats celebrated. "I'm pleased that the bike and pedestrian and transit infrastructure will move forward so we can build a responsible transportation system," Billig says. When voters voted for Inslee, Billig says, they knew what they were getting. Washington Attorney General Bob Ferguson announced on Monday his office's first successful enforcement action against a CROWDFUNDING CAMPAIGN that didn't deliver. The $55,000 King County Superior Court judgment against Tennessee resident Edward Polchlopek III — who in 2012 started the Asylum Playing Cards Kickstarter campaign with the goal of producing a deck of cards featuring horror-themed illustrations by a Serbian artist — is in excess of the $25,146 the campaign actually raised from its 810 backers. In April 2014, Ferguson filed suit against Polchlopek and his company Altius Management on behalf of the 31 Washingtonians who invested in the campaign. The campaign reached its initial goal of $15,000 in October 2012. Polchlopek then solicited additional contributions from backers by promising more Asylum-themed "rewards": poker chips, a ceramic "dealer button" and a costume straitjacket. The Attorney General's Office says that none of the backers received the promised items.